Mario Bortolotto was a journeyman defender who began his VFL career at Geelong, only to be dumped without warning after a handful of senior appearances. Bortolotto played 14 games for the Cats between 1979 and 1980. He was then picked up by Carlton – and through a mixture of diligence, luck and circumstance, gained a place in the Blues’ 1981 and ’82 Premiership teams. By coincidence, Bortolotto’s career at Princes Park ran parallel with that of West Australian sensation Peter Bosustow. They played their first and last matches for Carlton together, and shared in the glory of those back-to-back flags. But while ‘The Buzz’ kicked 146 goals in his celebrated 65 games, Bortolotto managed just 30 matches and one goal over the same period. Since then, it has become fashionable to disparage Bortolotto as barely a fringe player – conveniently overlooking the fact that he spent his career at Carlton battling for his place in a playing list that in terms of depth of talent, was one of the strongest in our history. In reality, he was more than a handy alternative anywhere in defence, and reliable whenever he was given his chance to play in big games. He was also popular around the club, particularly because of his ready sense of humour. For a period of time, he also was a flat-mate of Blues speedster Alex Marcou. This was evident when he once participated in one of Lou Richard’s stunts for The Sun newspaper. Lou had made a statement along the lines of, ‘the Blues can’t win this week. If they do, I will have Mario tip a bucket of spaghetti over my head in Lygon St.’ Carlton duly got up, and a few days later, the back page of the paper featured a beaming Bortolotto doing just that; emptying a large bowl of pasta (complete with sauce) over a hapless Richards. Mario’s path to VFL football began at his home town of Koondrook in north-western Victoria. After a standout couple of seasons for St Patrick’s College at Ballarat during the last years of his schooling, he was playing senior football for local club Leopold when Geelong first showed interest in the solidly-built centre half-back. In 1979, he made his VFL debut for the Cats, and racked up 14 games and three goals over two seasons. In one of those matches – against Carlton at Kardinia Park in round 12, 1979, he impressed by keeping Carlton’s star forward Mark Maclure under a tight rein all day, as Geelong inflicted a rare defeat on the Blues. He didn’t know it at the time, but that performance was to be the pivotal moment in Bortolotto’s football career. Having completed his third pre-season with the Cats in 1981, Mario was enjoying himself at Geelong’s presentation night when he was shocked to see someone else called up on stage to receive his number 29 guernsey! Only then did a club official come over and tell him that he was not required that year. Mario’s response can easily be imagined, but suffice to say that from that day on, he would have nothing to do with any of the non-playing staff at Kardinia Park. When word filtered through to Princes Park that Geelong has discarded one of their big defenders, the memory of Bortolotto’s earlier effort against Maclure was still fresh. Carlton’s match committee quickly decided that the 23 year-old was worth a punt, and Mario gratefully accepted an invitation to continue his career in navy blue. He was given guernsey number 6, and made his debut for his new club - off the bench - in round one of 1981, against Richmond at Waverley. Carlton thrashed the Tigers by ten goals, as Bortolotto’s senior career was reborn. He actually sat on the pine for his first three matches, before eventually making the starting line-up for Carlton’s round four game against Footscray at Waverley. The Blues had another comfortable win – during which it was reported that Bortolotto almost brought the house down with a dashing, four or five-bounce solo run from half-back, and a shot for goal that hit the post. But even that effort couldn’t prevent him from being sent back to the Reserves the following week, and he didn’t regain a place in the senior side until the eve of the finals. Later, Mario ('Tatts") summed up his time at Carlton as a Cinderella story – which really began to unfold when he was selected as a reserve for the 1981 second Semi Final. The fact that Carlton’s opponent was Geelong probably had something to do with it, even though in the end Bortolotto’s impact on the match was of little consequence. After a tight first half, the Blues took control in the third quarter, and kicked away to win by 40 points – very much to Mario’s delight. Although he had been given little game time against Geelong (or perhaps because of it) Bortolotto retained his place as a reserve in the Grand Final team when the Blues met Collingwood for the ‘81 flag. Mario’s career reached a pinnacle that afternoon, as Carlton triumphed by 20 points in a slogging contest on a muddy MCG. In the TV footage of the game, Bortolotto can clearly be seen wearing his tracksuit top as the Blues do their victory lap, which shows that he spent most, if not all, of the game where he started – on the bench. Coach David Parkin later apologised profusely for not giving him more time on the field. Bortolotto’s second season at Princes Park unfolded much like his first. He was in and out of the side throughout the year, while the defending Premiers trod a much tougher path to the finals. After finishing third on the ladder, the Blues lost a torrid Semi Final to Richmond, and then had to overcome Hawthorn in the Preliminary Final to earn another shot at the Tigers for the flag. Carlton’s hero against Hawthorn had been defender Rod Austin, who, after being knocked senseless in the first quarter, returned to the field and held their champion Leigh Matthews in check while the Blues ran out five goal winners. However, during a light training run the following morning, Austin was accidentally kicked on a thigh, and tragically ruled out of the Grand Final. So, on the following Thursday night, Bortolotto was named at full-back as Austin’s replacement. Already starting warm favourites for the Premiership after their convincing Semi Final win over Carlton, Richmond must have felt even more confident when they sent their decorated captain David Cloke to full-forward for the Grand Final. After all, Cloke was taller, heavier, more experienced, and far more accomplished than his opponent. But Mario played the game of his life, and held Cloke to three goals from just a handful of possessions while the Blues triumphed by 18 points. Mario may have felt out of place accepting his Premiership medal in 1981, but in ’82 it was richly deserved. He collected a third winner’s medal in 1983, when Carlton again defeated Richmond in the final of the Night Premiership at Waverley Park in July. By then however, having achieved more than he really ever thought possible, Mario had decided that he would call it a day after that season. In the end, that decision was hastened, when he was reported for striking North Melbourne’s Donald McDonald during a hectic clash at Princes Park in round 21. 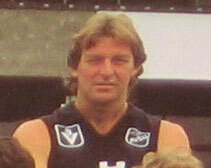 Peter Bosustow was also reported that afternoon, copped four weeks, and never played for Carlton again. Like ‘the Buzz’, Mario was found guilty and suspended for two matches, but Carlton lost the Elimination Final to Essendon, and there were no further opportunities. During the 1984 pre-season, Bortolotto seriously injured his ankle, this plus some other long term injuries curtailed his playing career with the Blues. He was kept on the list for the next two seasons but failed to add to his games tally with his beloved Carlton. A plumber by trade, Bortolotto once told a Carlton fan at training that he was deeply grateful that he had lived the Cinderella story. He was very aware of the great players of the game that had come and gone without ever playing finals football, while he had been blessed by the opportunity to play in two great Premiership teams. As well as his two Grand Final winners' medals and his Night Series flag, Mario was also awarded Carlton’s Best Clubman award in 1982. He celebrated his one and only senior goal for the Blues in round 10 of 1983, against North Melbourne at Arden St.
Whatever the merit of his ability, Mario Bortolotto certainly packed an enormous amount of joy and success into his 30 games with the Old Dark Navy Blues. In 1986, Bortolotto transferred to VFA club Sandringham with Blues team-mate Scott Howell. In 1990, Bortolotto was the runner for St Kilda who was being coached by his 1982 premiership teammate Ken Sheldon. Contributors to this page: Jarusa , Bombasheldon , molsey , tmd1 , PatsFitztrick , p(12)terg , WillowBlue , true_blue24 , Juzz , BlueWorld and admin . Page last modified on Tuesday 16 of May, 2017 18:06:46 AEST by Jarusa. 1977 Rd 5 - Maclure BOG Vs Sth Melb. 1985 Prac Match Results Vs Sydney Swans.